A protest is being held outside Wrexham Council's headquarters over the planned closure of an English-medium primary school. Wrexham Council plans to close Ysgol Pontfadog in August next year, claiming there is a low demand for English-language education in the area. However, campaigners say the area is mainly English-speaking and there is a need for an English-medium school. 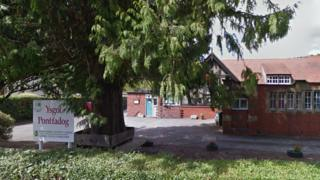 There are 18 pupils at the school in Pontfadog, near Llangollen. Speaking on Good Morning Wales, campaigner Jools Payne, who is a Glyntraian community councillor, said: "It's really important English-medium is maintained at this school. "The vast majority of people who live in the Ceiriog Valley, according to the 2011 census, are predominantly English-speaking at home. "We're not anti-Welsh, we're pro-fairness." NASUWT (National Association of Schoolmasters Union of Women Teachers) members are also attending the protest, alongside about 30 parents, teachers and children. The association said it wants to avoid redundancies, claiming five of its members and approximately 20 other staff could be at risk of losing their jobs. Councillor Phil Wynn, Lead Member for Education, said: "I can confirm that the school is not recruiting for September 2018. "The school has had to make difficult decisions for the new academic year regarding staffing and they have followed the agreed redeployment and redundancy procedures which have been approved by the local authority and unions."